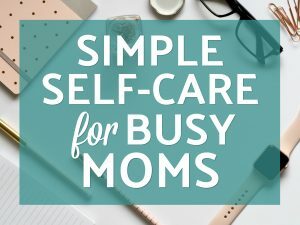 Taking care of yourself can be a challenge for even the most seasoned work-at-home mom, but it doesn’t need to be! Here are some quick, easy, and simple things you can do to take care of yourself NOW. One thing I find as a writer, and especially a busy work-at-home mom, is that self-care often falls by the wayside. I’m talking basic stuff: drink enough water, don’t eat crap when I’m stressed out over deadlines, do a little exercise that doesn’t involve vacuuming, get enough sleep so I’m not a complete zombie the next day. I know I’m not alone in this. I’ve talked to enough fellow moms to know that this is a common, if not universal, challenge. 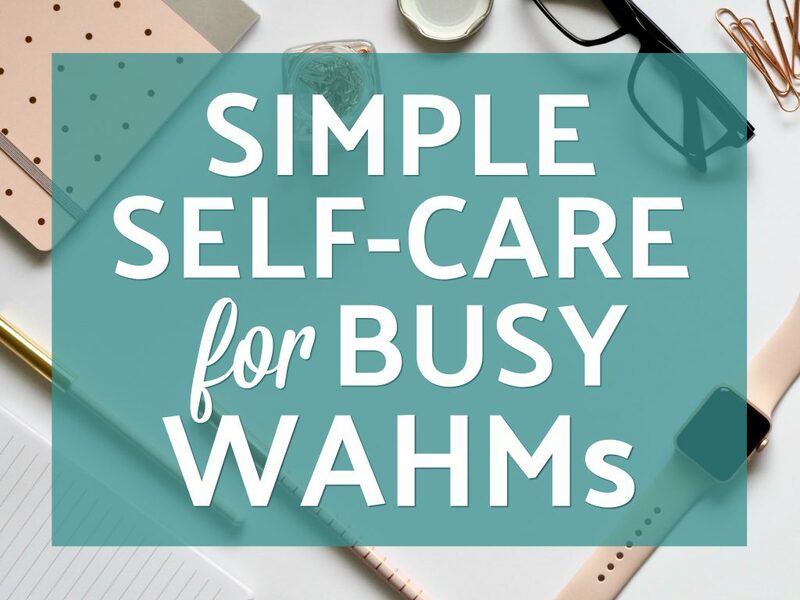 One of my best tools in the self-care box is the mantra “Keep It Simple.” Any time I find myself frazzled at both ends, it usually means I’m taking on too much and letting my life get overly complicated. On the “don’t eat crap” front, I’ve tried to focus more on addition rather than subtraction. If I’m craving a sweet, I’ll say, “Okay. I’ll eat this piece of fruit, and then if I’m still craving the chocolate bar, I’ll let myself have it.” Usually, I eat the fruit, and it curbs the craving. For salty, I eat tamari almonds. Tamari is a soy sauce that’s brewed from pure soy, not wheat. (The flavor is similar to soy sauce but richer with more of an umami flavor…look at me being all fancy.) You can buy them, but they’re kind of expensive, and they are sooooo easy to make. Here’s a recipe at Vegan Gretchen that I love. It can be a little hard to find tamari, especially if you don’t have easy access to a natural foods store. Every so often, I’ll find it at the grocery store, but I usually have to order it. I love the flavor of tamari so I order multiple bottles or a big jug of the stuff and use it in place of soy sauce in any recipe that calls for that ingredient. Sleep is a constant, constant battle. And if anyone has a good answer or tool or trick here, please, please leave it in the comments. One thing that helps me get more sleep is to have a bedtime ritual and stick to it. Ideally, all screens off at my kids’ bedtime (but let’s get real, this doesn’t always happen). Take a shower and use magnesium oil afterward to help me relax. (Bonus, magnesium oil really helps with the back pain I can get from working at a computer all day.) You can buy it pre-mixed, but I’ve started making my own. It’s really easy, and it’s so much cheaper. I use the recipe at Wellness Mama. She also has really good information about the benefits of using magnesium oil. One absolute bedtime constant is that I read myself to sleep on my Kindle. I LOVE my Paperwhite because I can turn off the lamp and still read. It turns off automatically, so most mornings, I’ll wake up snuggling it. As far as exercise, I like to keep it really simple. Walking. I’ll use it as a head-clearer throughout the day. Two laps around the block. But I wear a FitBit, and those steps add up, y’all. In the past, I’ve done the whole “drive to the gym, use the exercise equipment, shower, get dressed, re-do my hair and makeup, etc.” route. It would eat up my entire morning, and half the time, I’d just use the track or treadmill anyway. When the weather is nicer and I don’t have deadlines pressing in from all sides, I like to take longer walks. There are some nature trails nearby that are lovely. And the great part about longer walks is that it really gets my creative juices going. For some reason, I write some of my best character dialogue while walking. I’ll bring my phone along and dictate ideas and snippets directly into a Google Doc. Thankfully, I do feel like I have hydration down pat. Dehydration saps you of energy and makes you more likely to mindlessly snack, which adds to that sluggish feeling. I cut out everything but water and my morning coffee (and the occasional smoothie, but that’s like drinking a salad, right?). Hubby received a personalized Yeti tumbler a couple Christmases ago from co-workers, and I love it. It genuinely keeps my water cold all day. They’re also kind of pricy. A fun splurge, yes. But I decided to try a knock-off version, and it works just as well. Also it’s a cute color, so I actually like it and use it more often than the Yeti. I’m curious. What’s your biggest self-care challenge? Your best self-care tip?